Each year, YWCA USA, and YWCA local associations around the country, along with friends, partners, organizations, businesses, schools and supporters come together in the third week of October for a Week Without Violence, where we raise awareness about the devastating effects of domestic violence. As the largest network of domestic violence service providers in the United States, we support victims of domestic violence in communities around the country and work, year-round, on legislative actions and issue education that can bring an end to all forms of violence against women. On October 19, 2016, YWCA Southeastern Massachusetts was on the University of Massachusetts Dartmouth Campus for the Clothesline Project Display. From 10:00 A.M. until 1:30p.m. 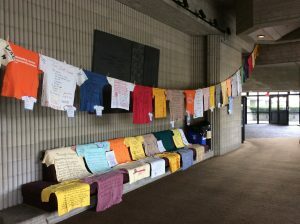 T-shirts that were designed by domestic violence survivors and their loved ones were displayed across the hall in the campus center. UMASS students walked by and observed the clothesline display. 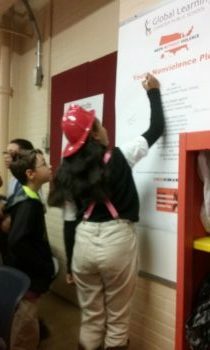 Some students were saddened at the powerful content of T-shirts. Some were inspired to create a T-shirt of their own due to being a survivor themselves. In the background of the display, the sound of a gong rang every 12 seconds to represent a woman being beaten every 12 seconds in America. Every 3 minutes, the cry of a whistle represented a woman who is raped every three minutes in America. A painful ringing of bells occurred every 15 minutes, representing a woman who dies of abuse every 15 minutes in America. 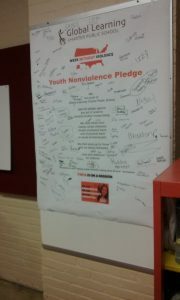 Awareness was raised and students want to continue to help raise awareness against violence in our community. Survivors also want to participate in their process of healing.